The Pinsk massacre was the mass execution of thirty-five Jewish residents of Pinsk on April 5, 1919 by the Polish Army. The Polish commander "sought to terrorize the Jewish population" after claiming to being warned by two Jewish soldiers about a possible bolshevik uprising.. The event occurred during the opening stages of the Polish–Soviet War, after the Polish Army had captured Pinsk. The Jews who were executed had been arrested were meeting in a Zionist center to discuss the distribution of American relief aid in what was termed by the Poles as an "illegal gathering". The Polish officer-in-charge ordered the summary execution of the meeting participants without trial in fear of a trap, and based on the information about the gathering's purpose that was founded on hearsay. The officer's decision was defended by high-ranking Polish military officers, but was widely criticized by international public opinion. The battle for Pinsk was won in March 1919 by General Antoni Listowski of the Polish Army regional commander of the Polish forces in Podlasie. The city was taken over in a late-winter blizzard with considerable human losses sustained by the 34th Infantry Regiment under Major Narbut-Łuczyński who forced the Bolsheviks to retreat to the other side of the river. Before their withdrawal however, the Russians had raised an armed militia composed of a small, non-representative group of local peasants and young Jewish communists who kept on shooting at the Poles from concealment. An interim civilian administration was set up in Pińsk, but the hostilities continued. There were instances of Polish soldiers being singled out at night and murdered. 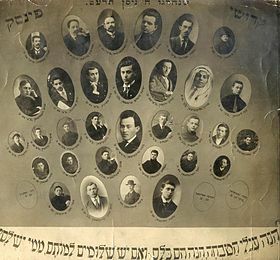 On April 5, 1919, seventy-five Jewish residents of the city met at a local Zionist center to discuss the distribution of American relief aid according to eyewitness accounts.Public meetings were banned at the time because random shots were still being heard and the town was recently under Bolshevik control. According to some accounts the meeting had received approval from Polish military authorities. When major Aleksander Narbut-Łuczyński heard, that the meeting was a Bolshevik gathering, he initially ordered his troops to arrest the meeting organizers. The night before the event, two Jewish soldiers, Daniel Kozak and Motel Kolkier, reported that they were offered a bribe to join bolshevik conspiracy in local synagagoue. The town commander fearing a Bolshevik uprising,which he did not investigate, ordered the execution of the hostages. Within an hour, thirty-five detainees were put against the wall of the town's cathedral, and executed by a firing squad composed of the Polish soldiers. It was claimed that some men and women were stripped and beaten. Initial reports of the massacre, echoing the claims that the victims were Bolshevik conspirators, were based on an account given by an American investigator, Dr. Franciszek (Francis) Fronczak, who was a former health commissioner of Buffalo, New York. Fronczak became member of the Paris-based Polish National Committee (Komitet Narodowy Polski, KNP), where he directed the organization's Department of Public Welfare helping thousands of refugees. He arrived in Europe in May 1918, with permission of the State Department. Back home, he was a leader of the National Polish Department of America, a major organization of Polish-American expats. Upon his arrival, he identified himself to local authorities as the ARC mission's Lieutenant Colonel sent to investigate local health conditions in hospitals. Although not an eyewitness, Fronczak accepted Luczynski's claims that the aid distribution meeting was actually a Bolshevik gathering to obtain arms and destroy the small Polish garrison in Pinsk. He himself claimed to have heard shots being fired from the Jewish meeting hall when Polish troops approached. He also claimed he had heard a confession from a mortally wounded Jew when he arrived at the town square where the executions had taken place. The initial wire reports of the massacre and a Polish military report which cleared the local authorities of any wrongdoing and denounced the Jewish victims, was based largely on Fronczak's testimony. The version of the events cited by the Polish parliament were based on the account of Barnet Zuckerman, a representative of the American Jewish Joint Distribution Committee who had interviewed survivors on the day of the massacre. At the time, he was in charge of delivering the relief aid from the Committee, negotiating the appropriate way to distribute it. Instead of personally investigating the matter, he went from Brest to Warsaw as soon as he learned of what had happened, where he publicized his version of the events as -"A Massacre of Innocent Civilians". Despite attempts of the Polish authorities to suppress the story, accounts of the incident in the international press caused a scandal which would have strong repercussions abroad. The Polish Group Commander General Antoni Listowski claimed that the gathering was a Bolshevik meeting and that the Jewish population attacked the Polish troops. The overall tension of the military campaign was brought up as a justification for the crime. In his order to the population of Pinsk of 7 April 1919, two days after the massacre, Listowski justified the massacre as the "town's Jews as a whole were guilty of the crime of blatant ingratitude". The Polish military refused to give investigators access to documents, and the officers and soldiers were never punished. Major Łuczyński was not charged for any wrongdoing and was eventually transferred and promoted reaching the rank of colonel (1919) and general (1924) in the Polish army. The events were criticized in the Sejm (Polish parliament), but representatives of the Polish army denied any wrongdoing. Who were these thirty-five victims? They were the leaders of the local Jewish community, the spiritual and moral leader of the 5,000 Jews in a city, eighty-five percent of the population of which was Jewish, the organizers of the charities, the directors of the hospitals, the friends of the poor. And yet, to that incredibly brutal, and even more incredibly stupid, officer who ordered their execution, they were only so many Jews. In 1926, kibbutz Gevat (Gvat) was established by emigrants from Pinsk to the British Mandate of Palestine in commemoration of the Pinsk massacre victims. We are convinced that no arguments of a Bolshevist nature were mentioned in the meeting in question. While it is recognized that certain information of Bolshevist activities in Pinsk had been reported by two Jewish soldiers, we are convinced that Major Luczynski, the Town Commander, showed reprehensible and frivolous readiness to place credence in such untested assertions, and on this insufficient basis took inexcusably drastic action against reputable citizens whose loyal character could have been immediately established by a consultation with any well known non-Jewish inhabitant. The report also found that the official statements by General Antoni Listowski, the Polish Group Commander, claiming that Polish troops had been attacked by Jews, were "devoid of foundation." ^ Norman Davies. "One conflagration among many". White Eagle, Red Star: The Polish-Soviet War 1919-20. Random House. pp. 47–. Retrieved 26 April 2014. ^ Maciej Rosalak, Ponury konflikt wśród poleskich błot (A gloomy fight in the Polesie mud) Archived 2014-05-02 at the Wayback Machine Rzeczpospolita, 14-04-2011. ^ Dr. Andrzej Nieuważny, Atlantyda Polesia p. 4 of 6. Rzeczpospolita (newspaper) 15 June 2013. ^ a b c Yisrael Gutman. "Poles and Jews between the Wars: Historic Overview." In: Herbert Arthur Strauss, ed. Hostages of Modernization: Studies on Modern Antisemitism, 1870-1933/39. Walter de Gruyter, 1993. ^ a b Mieczysław B. Biskupski, Piotr Stefan Wandycz. Ideology, Politics, and Diplomacy in East Central Europe. Boydell & Brewer, 2003. ^ a b Davies, Norman (2005). God's Playground: A History of Poland. Columbia University Press. p. 192. ISBN 0-231-12819-3. ^ Józef Lewandowski. "History and Myth: Pinsk, April 1919". Polin 2, 1988. ^ a b Michlic, Joanna Beata (2006). Poland's Threatening Other: The Image of the Jew from 1880 to the Present. University of Nebraska Press. p. 118. ISBN 0-8032-3240-3. ^ Joseph W. Bendersky (2000). The "Jewish Threat": Anti-semitic Politics of the American Arm. Basic Books. pp. 84–85. ISBN 0-465-00618-3. ^ a b c d e f Carole Fink (2006). Defending the Rights of Others: The Great Powers, the Jews, and International Minority Protection, 1878-1938. Cambridge University Press. pp. 179–180. ISBN 0521029945. ^ Kenneth J. Calder (1976). Britain and the Origins of the New Europe, 1914-1918. Cambridge University Press. ^ Henry Morgenthau (1922). "Appendix. Report of the Mission of the United States to Poland". All in a Life-time. Doubleday, Page and Company. ^ Henry Morgenthau, All in a Life-Time. Doubleday, Page and Company, 1922 Original from the New York Public Library. Digitized Jul 17, 2007. Wir die Eltern und Familien von den 35 unschuldig Ermordeten in Pinsk am 5 April of J. haben bevollmächtigt den Herrn Silbermann mit dem Herrn Botschafter Morgentau, wahrend seiner Anwesenheit in Pinsk zu sprechen und ihn zu bitten. I. Um die Bestrafung aller Personen welche an der Ermordung unserer Kinder am 5 April teilgenommen haben die Höheren Leute, wie auch die gewöhnlichen Soldaten. II. Um Geld-Belohnung der ohne Stutze hinterbliebenen Eltern und Familien die im Blütenjahren erwachsene Kinder mit Gewalt entrissen worden welche ihre ganze Hoffnung und Lebensquelle warm. ^ (in English) Tadeusz Piotrowski (1997). Poland's Holocaust: Ethnic Strife, Collaboration with Occupying Forces and Genocide... McFarland & Company. pp. 41–42. ISBN 0-7864-0371-3. Czerniakiewicz, Andrzej (2004). "Ekscesy antyżydowskie wojsk polskich na Kresach Północno-Wschodnich RP". Świat niepożegnany (in Polish). Warsaw/London: ISP PAN / RYTM. ISBN 83-7399-083-6. This page was last edited on 14 April 2019, at 10:24 (UTC).